This past Tuesday’s networking event in the Longwood Medical Area of Boston was a fun, energetic start to the New Year. 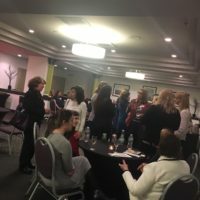 We had more than 30 ladies attend, and I am always interested to meet new women and see the mix of professions and organizations – influenced in part by where we hold the networking event. I met women from all different healthcare industries and professions – quality, marketing and digital branding, law, assisted living, and a physician with her doctorate from another country who is seeking a job now that her daughter is a bit older and in school. We discuss so many great things, from healthcare industry changes, potential solutions to job hurdles, or sometimes just a tip about parking or an event. The kaleidoscope of paths and range of professions that fall under the “healthcare” label is fascinating, and one I look forward to learning about at each networking event. WHCM 2018 Spring Forum: Health Care Innovation: How Market Players are Shaking Things Up and the Impact on Your Career	Feedback and Constructive Criticism: How Do you Like it Served?